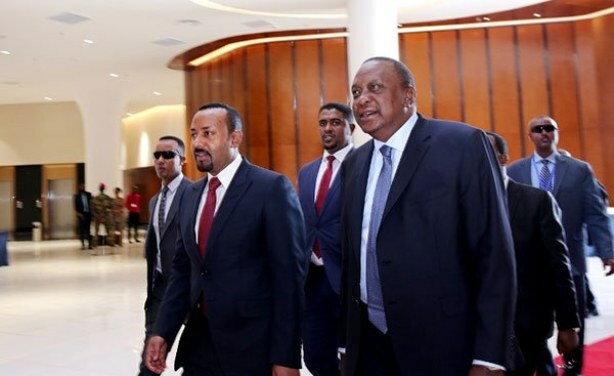 Kenya's President Uhuru Kenyatta and Ethiopia's Prime Minister Abiy Ahmed have said that the regional mega initiative, the Lamu Port-South Sudan-Ethiopia Transport Corridor, is key to unlocking the economic potential of the entire East African region. The two leaders have also called for the fasttracking of the ongoing transformation of Moyale town into a cross-border trade hub in the region. Ethiopian PM Abiy Ahmed, left, and Kenya's President Uhuru Kenyatta attend the Kenya-Ethiopia Trade and Investment Forum in Addis Ababa on March 1, 2019.